If you love rice, but not watching a boiling pot, this fast, easy microwave cooker is the hack for you. Fluffy, freshly cooked rice smells divine, tastes delicious, and has irresistible texture. But it requires time and attention to cook, and elbow grease to clean the pot. This simple, brilliant cooker makes preparing rice and other grains much faster and easier, with no sacrifice in quality. 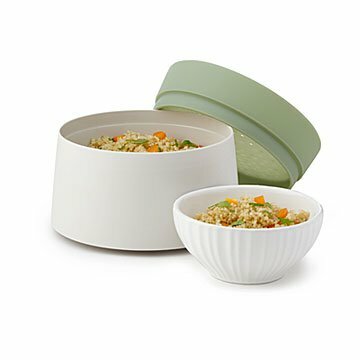 Fill it with cold water and rice, put the top on, and microwave it to perfection (cooking chart with measurements and times included). Even whole grains generally cook in under 16 minutes or so; couscous in only 2-3. Use it in the morning to make oatmeal, and experiment with delectable new grains. It's a seriously handy hack for upgrading dorm and work food, and a snap to clean (thanks, dishwasher) and store, too. But we have a feeling it won't spend much time in the cabinet. Designed in Barcelona. Made in China. Microwave, freezer and dishwasher safe.